Celebrate two years with your Mercedes with Service B from Ammstar. 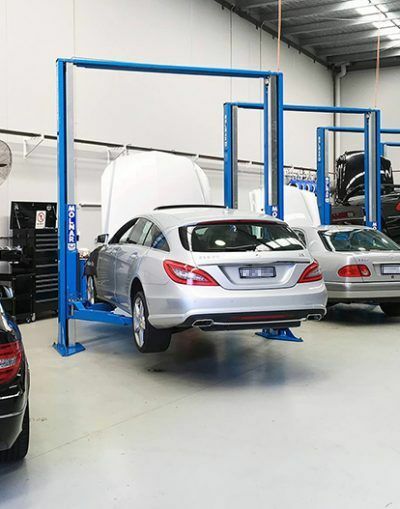 Occurring at the end of your Mercedes-Benz’s second year and alternating yearly with Service A, a Mercedes-Benz Service B (otherwise known as ASSYST 2) offers a more comprehensive service. In addition to routine checks, Service B includes a deeper inspection of crucial components and subsystems. At Ammstar, we live and breathe the Mercedes name. While our specialist qualified workshop operates independently from the dealership, we strictly follow manufacturer guidelines. Is your Mercedes-Benz in need of a deeper routine service? If so, get in touch with a dedicated team of Mercedes-Benz specialists! What’s included in Mercedes-Benz Service B? At Ammstar, we make sure you’re getting your money’s worth when you come in for Service B. We have the tools and skills to access your vehicle’s onboard diagnostic system. With some Mercedes-Benz vehicles having in excess of 50 computers all networked together, there is likely to be some background fault or event data stored. We not only perform a full diagnostic vehicle check, we also analyse the data. This can help us identify potential problems and fix them before they become a larger issue. What stops car exhaust, dust and smog from entering the passenger cabin of your Mercedes? Your cabin filters. Typically located behind the glove compartment or behind the dashboard, the air conditioning filter is responsible for filtering out contaminants (like dust, pollen, and fumes) that enter through your car’s heating and cooling system. During Service B, our Mercedes-Benz specialists replace your cabin and air conditioning filters. This ensures clean, breathable air and a more comfortable, healthier ride. The additional adjustments and checks we include will vary depending on how old your car is, how many kilometres you have on it, and the specific model. For example, if your car has a sliding, panoramic or full vario / convertible roof sliding, we’ll take a look at it during Service B.
Mercedes Service B includes everything from Service A, too! Below is a snapshot of services involved in Service A – all of which are included in Service B. Using our stock of high-quality synthetic oils and fluids, we replace your engine oils and filter, keeping vital internal engine components in peak condition. Your engine oil isn’t the only fluid we look at during a routine inspection. Our skilled Mercedes-Benz technicians also inspect things like your hydraulic brake fluid, engine coolant and coolant due dates, power steering and washer fluid topping them up as needed. We’ll also lubricate a variety of components such as locks, latches and rubber stops if required. Handbrakes, seatbelts, interior and exterior lights – each plays an important role in keeping you safe. We inspect these for function, recommending further service if we uncover any problems. We look at the treads, thickness, and pressure of your tyres and assign a rating that tells you how long you can expect them to last. We then advise whether you should get them replaced now or if they will safely last you until your next scheduled service. We measure your brake discs and determine whether they’re approaching minimum safe thickness. We’ll then tell you how long you can expect them to last and whether they’ll make it to the next service. In addition to replacing your air conditioner cabin filter, we also perform a comprehensive inspection of your car’s HVAC system. From the dials to the condenser, we make sure you’re comfortable year-round. During an inspection of your car’s underbody, our skilled mechanics check your exhaust, steering, fuel tank and couplings. We keep a lookout for leaks and damage, ensuring your continuing safety. Believe it or not, some mechanics can’t do this! And if they can’t do something this simple, how can you be sure they haven’t overlooked more important issues with your Mercedes? Does your Mercedes drive like it should? Since we service and road test Mercedes-Benz vehicles every single day, we can accurately gauge how your car is performing – not all mechanics know what to look, listen, and feel for. With two workshops that cater specifically for the needs of Mercedes-Benz owners, Ammstar is your #1 choice for specialist service that operates independently from the dealer. Rely on Ammstar to deliver dealership-level service without the inflated price tag.